By J. Neal Morales Whether he’s combining traditional flavors, as Moira Hodgson writes, or fixing up an interesting dish of Pork Crubeens in which he delightfully includes the head, tail, and ears; one thing remains true about Christopher Daly. You will always receive service with a smile. 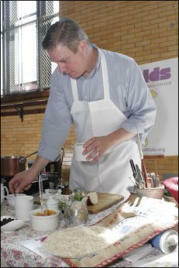 Christopher Daly is an executive chef, educated at the Culinary Institute of America Located just north of New York City in Hyde Park. Daly did his externship through CIA at the world renowned Beverly Hills restaurant, L’Orangerie. There, he was trained in classical and contemporary French Cuisine. By extending his externship Daly also served as Chef de Cuisine at Rose Café the cutting edge contemporary California Style Restaurant run by Rockenwagner alums Steve Mathews and Devlin Stuart. Daly’s career has taken him from Los Angeles to New York City to Paris and back where he has also worked as Stagier at Bouley, a New York Times 4 Star establishment and a handful of Michelin 3 stars. In 1990 Daly accepted a position as Chef D’Partie at Checkers in Los Angeles where he worked the hotline nightly with Thomas Keller and Robert Gadsby. Indeed it seemed as though this would be Daly’s home base, California. He remained in the state for several years with positions Chef de Cuisine at the Santa Monica Yacht Club; Los Angeles International Culinary Institute (LAICI) and as Sous Chef at Tatou Beverly Hills and was the subject of cover and feature stories in Nations Restaurant News and The Los Angeles Times Review. Perhaps it was the milder weather, the romanticism associated with venue, or perhaps just a fondness for the locale, but Christopher Daly was in a New York state of mind by 1993. With the title of Executive Chef, the 140-seat West Broadway Restaurant Gallery Bar hired Daly who not only designed and priced the menus for lunch, dinner, and the bar –but also, wrote and priced the wine lists. His next assignment landed him at the Plaza Hotel. The chef in charge of The Edwardian Room, Daly played a major role in the French/American Restaurant’s near $3 million dollar annual sales report. This time his clients included world renowned guests and food world luminaries such as Kevin Zraly who helped conduct wine tastings and dinners for Smith Barney. His time there earned him the DiRona Award in 1996 and 1997. So how does an award-winning executive chef celebrate the coming of the new millennium? Well he moves on. At Bellew, in New York Daly was hired to be their executive chef in 1997 and won several accolades from The New York Times, The New York Observer and Zagat to name a few. With the passing of owner Joe Tummulty Daly began his private work which led to stints as The Chef for The Arch Bishop of New York and then years later to serving several US Ambassadors. In the interim Daly has also created Hip4Kids which is an 11 year old not for Profit Company that was designed to teach children and parents about healthy eating to combat childhood obesity and type II diabetes. To Date Hip4Kids has educated over 200,000 children and their parents here and across the country. To facilitate funding for Hip4Kids Daly has also created Hip World Foods, his answer to “The Next Paul Newman Company” Sales of the products provide the funding for Hip4Kids and Daly has 5 US Food Patents employed in the creation of 200 functional food products, his first The Chocolate HIP Cookie was first rolled out for a special event for Dr.Oz in Grand Central Terminal has appeared on Rachael Ray’s Healthy Snack of the Day for purchase through www.hipsnacks.com &is now available for retail. Daly continues to teach, cook privately and consult as well as helming Hip4Kids and is looking forward to an ambitious jobs creation program he has been planning to launch with local schools for community chef teachers that would work through their schools and Hip4Kids to continue bringing programming to New York’s neediest neighborhoods. FOR PARENTS, TEACHERS & STUDENTS Hip4Kids Inc., a 501 c (3) company, is a not-for-profit corporation designed to educate parents and children on the fundamentals and ongoing importance of healthy eating and good nutrition. Hip4Kids’ primary components include media learning programs and community outreach through innovative educational lifestyle programs for children and young adults. Hip4Kids’ Mission is: • To build an understanding of healthy food and good nutrition to prevent childhood obesity, cancer and diabetes • To encourage the exploration of local food sources to promote local produce • To promote taste recognition of fresh and well- prepared food to safeguard health • To emphasize the social value of food knowledge • To illustrate the importance of physical fitness and healthy lifestyles.